Virginia Board of Physical Therapy 3.5 (Type 1)–Please check with your state board for approval as most physical therapy boards will reciprocate approval for continuing education. The American Academy of Health and Fitness (BOC AP#: P3645) is approved by the Board of Certification, Inc. to provide continuing education to Certified Athletic Trainers. This program is eligible for a maximum of 3.5 Category A hours/CEUs. Combined Training is an online course that teaches you how to expand your professional tools to include pre-performance and post-rehabilitation training based on the latest muscle physiology research. This course shows strength professionals how to program to account for interference theory along with recently discovered muscle clocks and the role that they play in muscle performance and rehabilitation outcomes. Packed with real-world clinical applications and sample routines, this course is designed with the working professional and immediate field application in mind. The Combined Training continuing education home study course is offered to you in a distance-learning format, providing a logical progression from initial concepts to clinical applications. The manual introduces the problems of combined strength and conditioning programming and its impacts on muscle performance. The content includes an explanation of interference theory and molecular muscle confusion and how mechanisms related to muscle strength, endurance, and power compete. Combining the latest research on muscle physiology, the existence of muscle clocks is introduced and how they impact strength and conditioning programming and performance are explored. 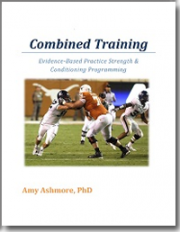 The manual moves from the latest science behind strength and conditioning to program design including a review of basic programming principles and variables and how-to use them now based on current research. The manual ends with suggested exercises and sample routine for immediate use. 1. Discuss interference theory and how it relates to combined training. 2. Explain what muscle clocks are and the role that they play in strength and conditioning training outcomes. 3. Develop effective combined training sessions to increase muscle performance. 4. Organize mode, frequency, duration, volume, and intensity of training to design sessions and programs that maximize muscle performance. 5. Design effective cardiovascular and flexibility training programs that improve endurance and flexibility while minimizing the negative effects on muscle performance. Electronic format —all written materials are provided in PDF format and include the 81-page training manual, 62-page study guide, and 30 question practice test. Other materials include a 30-minute MP4 online tutorial and a 44-question MC test. Instructions for completing the 44-question multiple-choice online test and obtaining CECs are also included online. The course package is available for immediate access and download after purchase. All materials for this electronic format course are available electronically. Nothing is mailed.